Crossing the bridge to the south will lead to the entrance to Gloombound Mine. A cart can be found nearby, containing a piece of owned ebony ore and a pickaxe. 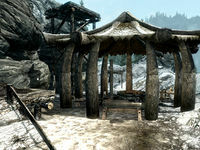 On the far side is a covered forge area consisting of a forge, a grindstone and a workbench with a piece of ebony ore and an ebony ingot on top. Beside the forge there is a wooden table and chair, with a bottle of wine on top. A bucket to the rear contains another unowned piece of ebony ore. To the northeast of the covered area is a ramp leading up to a smelter, while to the left of the smelter is a path that leads up to the mine, passing several barrels and an orichalcum ore vein on the left. Past the mine is an immobile cart containing three more owned pieces of ebony ore. Beyond the cart is an open-sided hut with an unowned single bed inside and an apprentice locked chest under the bed. 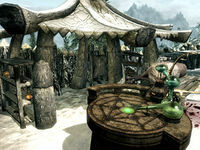 Opposite this is a long wooden table with a copy of the Smithing skill book Heavy Armor Forging and two bottles of wine. There is a small fire on a rock at the rear of the hut beside some barrels with a baked potato in front of it. This page was last modified on 6 November 2017, at 12:58.